I raise up my voice—not so I can shout, but so that those without a voice can be heard...we cannot succeed when half of us are held back. And then, out of that silence came, thousands of voices. One child, one teacher, one book, and one pen, can change the world. The solution is one, and it is simple. It is education, education, education. No one can defeat us. We can’t be afraid of anyone. I believe it's a woman's right to decide what she wants to wear and if a woman can go to the beach and wear nothing, then why can't she also wear everything? It's hard to have a gun and kill people. Maybe that's why his hand was shaking. Maybe he didn't know if he could do it. But people are brainwashed. That's why they do things like suicide attacks and killing people. I can't imagine it – that boy who shot me, I can't imagine hurting him even with a needle. I believe in peace. I believe in mercy. When someone tells me about Malala, the girl who was shot by the Taliban – that's my definition for her – I don't think she's me. Now I don't even feel as if I was shot. Even my life in Swat feels like a part of history or a movie I watched. Things change. God has given us a brain and a heart which tell us how to live. 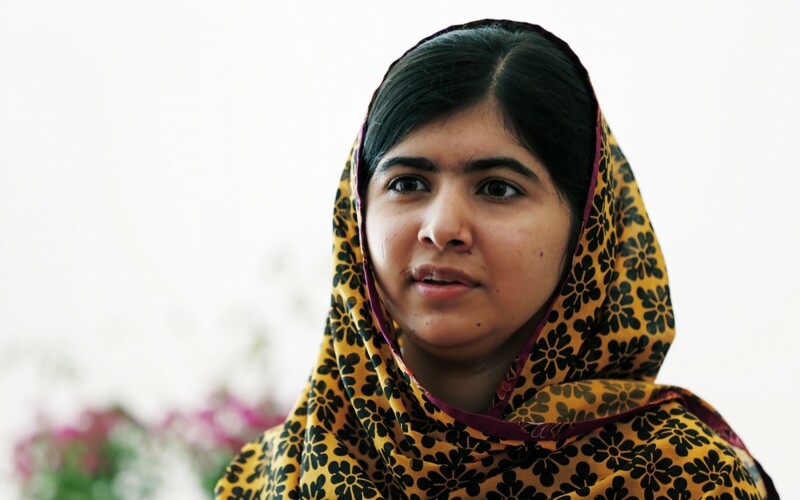 If he [the Talib] comes, what would you do Malala? …If you hit a Talib with your shoe, then there will be no difference between you and the Talib. You must not treat others…with cruelty...you must fight others but through peace, through dialogue and through education…then I'll tell him [the Talib] how important education is and that I even want education for your children as well… that's what I want to tell you, now do what you want. Education is education. We should learn everything and then choose which path to follow." Education is neither Eastern nor Western, it is human. Once I had asked God for one or two extra inches in height, but instead he made me as tall as the sky, so high that I could not measure myself. We human beings don't realize how great God is. He has given us an extraordinary brain and a sensitive loving heart. He has blessed us with two lips to talk and express our feelings, two eyes which see a world of colours and beauty, two feet which walk on the road of life, two hands to work for us, and two ears to hear the words of love. As I found with my ear, no one knows how much power they have in their each and every organ until they lose one. I told myself, Malala, you have already faced death. This is your second life. Don't be afraid — if you are afraid, you can't move forward. Our men think earning money and ordering around others is where power lies. They don't think power is in the hands of the woman who takes care of everyone all day long, and gives birth to their children. Life isn't just about taking in oxygen and giving out carbon dioxide. I don't want to be thought of as the 'girl who was shot by the Taliban,' but the 'girl who fought for education.' This is the cause to which I want to devote my life. When you see death, things change. ‘It doesn’t matter if I can’t smile or blink properly,’ I told her. ‘I’m still me, Malala. The important thing is God has given me my life. I think that the best way to solve problems and to fight is through dialogue, is through peaceful way. Education is my right and education is the right of your daughter and son as well. And I’m speaking up for them. I’m speaking up for peace. I am Malala. My world has changed but I have not. They only shot a body but they cannot shoot my dreams.